We picked up some fresh shrimp at the Farmers’ Market last week. It was expensive. I decided to use the shrimp sparingly over several meals. By combining it with rice and beans we hardly missed the quantity of shrimp with the quality of the overall dish. This made a perfect luncheon meal. The white bean mixture includes canned diced tomatoes and jarred pesto; easy to pull together. I used left- over Caribbean rice, but you could use any type of rice that you would like. I know it has been a while since I have published a blog post, but I have been spending very little time in the kitchen. There are so many great restaurants in New Smyrna Beach that we have been eating out quite often. 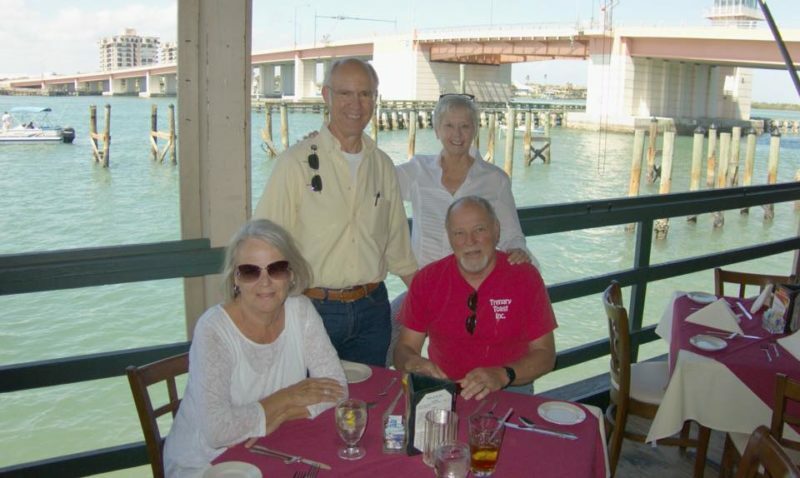 The above picture was taken with our friends Mark and Ruth at Riverside Grill on the Indian River (IntraCoastal Waterway). Most of the boats going under the drawbridge were headed South. Winter doesn’t want to give up and it is going to be much colder even here next week; just in time for bike week. I’m hoping to post a recipe for my Guinness Beef Stew in honor of St. Paddy’s Day soon. I am making it for friends next week. 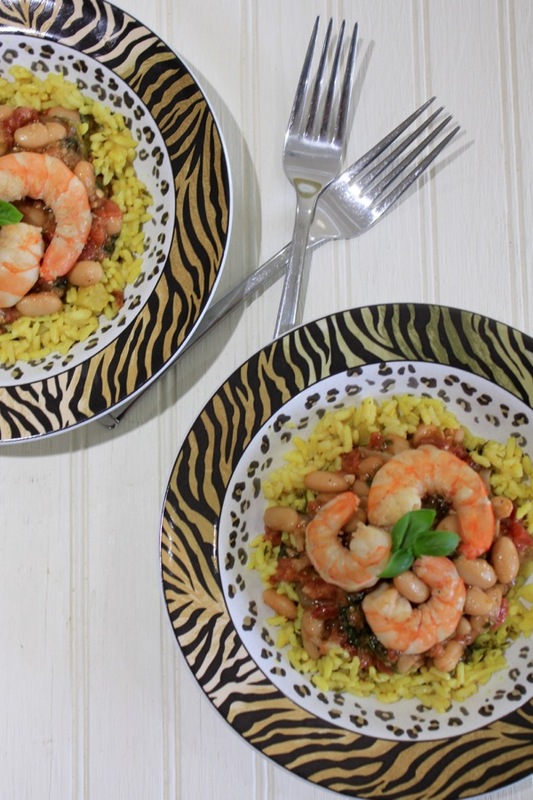 In the meantime, hope you enjoy this easy Shrimp Bowl recipe. Heat 2 Tablespoons oil in a large skillet over medium heat and cook until shallot is softened. Add tomatoes with their juices and salt and pepper to taste. Cook until sauce thickens slightly, about 5 minutes. Reduce heat to low, add beans and the pesto sauce. Cook until heated through. Remove bean mixture to a bowl. Heat remaining 1 tablespoon oil in skillet over medium high heat. Add shrimp and cook, stirring often until shrimp os cooked through, about 3 minutes. Add cooked rice to 2 bowls, top with bean mixture and place cooked shrimp over all. Serves 2. I so miss Florida Gulf Shrimp. When down in Naples last week for my sisters memorial, I didn’t get a chance to have any fresh seafood. Your lunch looks delicious. Florida shrimp is the best. I agree. So sorry about your sister, but glad you got to spend time with your other sisters. Don’t know why WordPress is making me anonymous. This looks incredible, Penny. 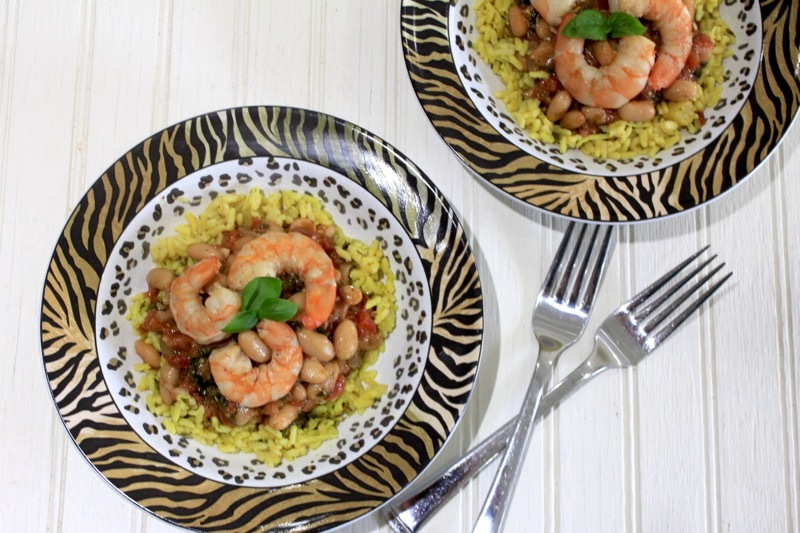 I loved so many of the shrimp/rice/bean dishes when Al and I visited areas of the South over a long period of time. Your recipe sounds very doable. Thanks! I think you would love this Jane. Hope your weather is moving toward Spring. Looks fab there..always so nice to see Fl pics for moi! Our Florida weather has turned on us Monique. Lows in the 40’s and windy. In my dream life, I am a travel writer and restaurant critic. Love eating out. Thanks Susan. This post was published by Penny on March 12, 2017.